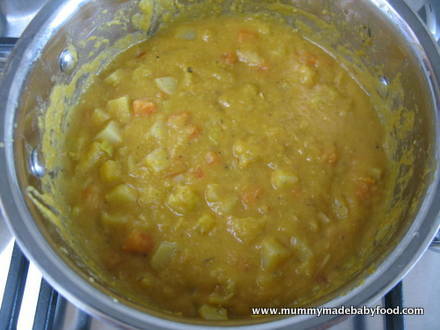 Here is a great baby soup recipe for both warming and filling your baby's tummy. Although not the most attractive of vegetables, root vegetables are generally popular with babies and small children due to their natural sugar content. The lentils in this recipe add both flavour and protein, making this a well-balanced meal on its own. 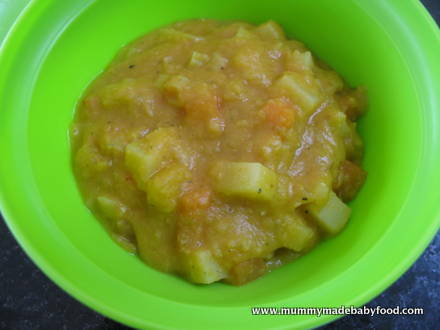 Root vegetables are packed with sugars, starches and other carbohydrates, making them ideal ingredients to include in baby soup recipes. The more they cook, the more of their sweetness that comes out into the dish. You can substitute the vegetables in the recipe below for any other root vegetables of your choosing. Be creative and follow your baby's taste buds! 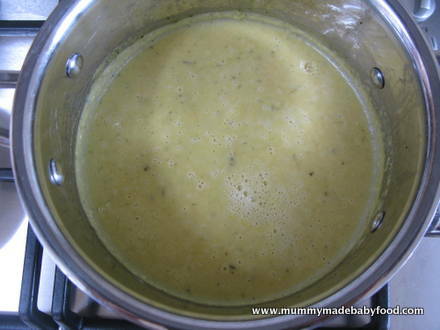 And feel free to add more liquid and puree to a smoother texture for smaller babies, whilst making the soup thicker and chunkier for older babies and toddlers. This recipe yields 6 servings and is suitable for freezing. 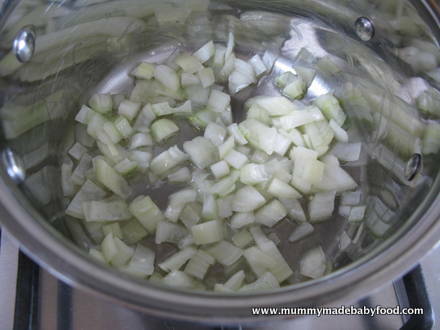 Heat some oil in a large saucepan, and fry the onions for about 2-3 minutes, until soft. 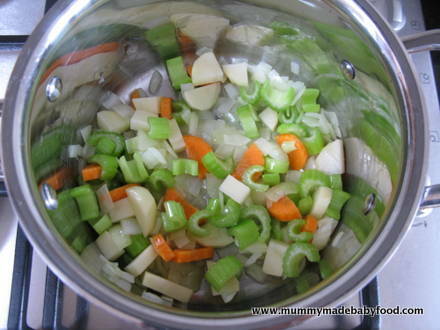 Add the celery, 1 diced potato and 1 sliced carrot, and cook for another 3-4 minutes. Add the vegetable stock, lentils and mixed herbs to the pan, bring to the boil, then simmer uncovered for 20 minutes. Meanwhile, dice the remaining carrots, potatoes and turnip into suitably-sized pieces. Remove the mixture from heat, allow sufficient time for it to cool, then puree to a smooth consistency using either a handheld blender or a food processor. Return to heat, and add the diced vegetables to the lentil mixture. Bring to the boil, add the tomato puree and chopped leek, cover and simmer for a further 20-30 minutes, until the vegetables are soft. Stir periodically to ensure the vegetables do not stick to the bottom of the pan. 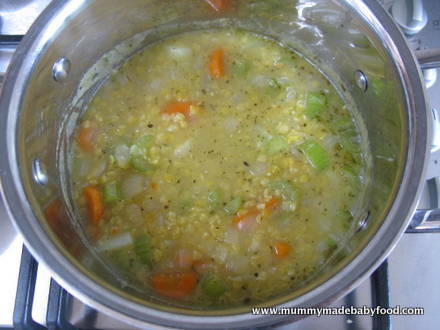 Remove the soup from heat, and allow sufficient time to cool before serving. 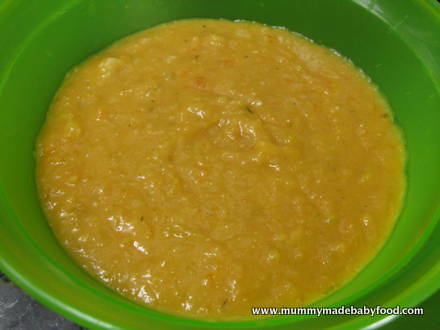 Puree to a smoother consistency for smaller babies, or serve chunky to older babies or toddlers.